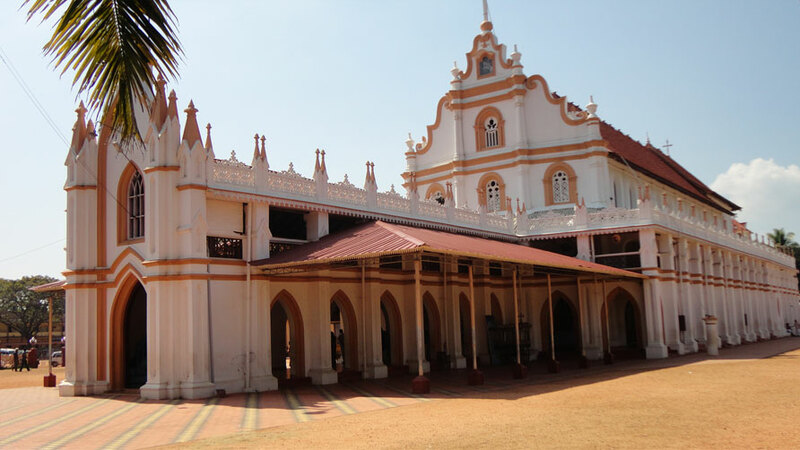 St. George Forane Church, Edathua was established in 29th September 1810 in Alappuzha district. It is situated on the banks of river Pamba and is dedicated to St. George. The architecture of this church has been influenced by the European structures. The first vicar of this church was Rev Fr. Valiaveettil Geevarghese Kathanar. At present Rev.Fr. Kurian Puthenpura is the vicar. This church popularly called as the Edathua church is famous for having miraculous powers for curing mental ailments and other diseases. The Catholic saint St. George is well known for healing such disorders. Many people come here to offer prayers and they believe that it would heal any disorders. This church has influenced the lives of people of all communities. The Edathua festival starts on April 27th and continues up to May 7th. This feast is conducted yearly and at that time the golden statue of St. George will be kept on a dais in the centre of the Church for 11 days. A procession of this statue is also held daily. The starting and ending of this feast is marked by the lighting of fireworks. Stalls are set up by local vendors in the Church premises and various cultural programs are also conducted. This church owns various institutions such as an Art and Science college, Higher Secondary School, High Schools, Lower Primary Schools etc. The church is at a distance of 24 km from Alappuzha and is on the Alappuzha – Thiruvalla Road.